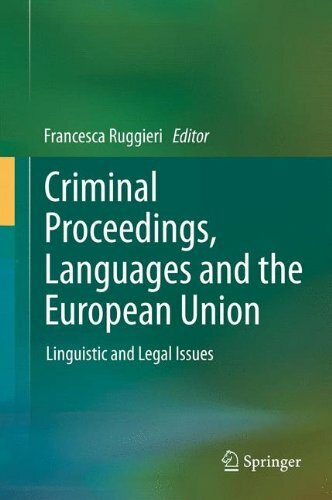 The book “Criminal proceedings, languages and the European Union: linguistic and legal issues” – the first attempt on this subject – deals with the current situation in the jurislinguistic studies, which cover comparative law, language and translation, towards the aim of the circulation of equivalent legal concepts in systems which are still very different from one another. In the absence of common cultures and languages, in criminal procedure it is possible to distinguish features that are typical of common law systems and features that are typical of civil law systems, according to the two different models of adversarial and inquisitorial trials. Therefore, the most problematic challenges are for the European Union legislator to define generic measures that can be easily implemented at the national level, and for the individual Member States to choose corresponding domestic measures that can best implement these broad definitions, so as to pursue objectives set at the European level. In this scenario, the book assesses the new framework within which criminal lawyers and practitioners need to operate under the Lisbon Treaty (Part I), and focuses on the different versions of its provisions concerning cooperation in criminal matters, which will need to be implemented at the national level (Part III). The book analyses the issues raised by multilingualism in the EU decision-making process and subsequent interpretation of legal acts from the viewpoint of all the players involved (EU officials, civil, penal and linguistic lawyers: Part II), explores the possible impact of the EU legal acts concerning environmental protection, where the study of ascending and descending circulation of polysemantic words is especially relevant (Part IV), and investigates the new legal and linguistic concepts in the field of data retention, protection of victims, European investigation orders and coercive measures (Part V).